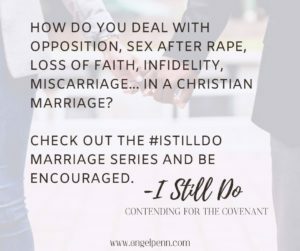 My sweet friend Angel Penn is featuring a series on her blog Experiencing Freedom on Biblical Marriage entitled Contending for the Covenant: A 20 Day Marriage Series. I am honored and so excited to be one of the featured bloggers in this series! 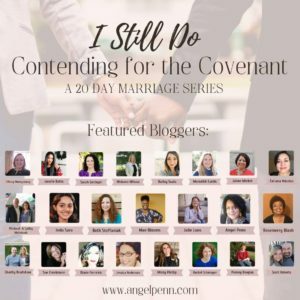 Check out this amazing lineup of guest bloggers. As a young wife and mom with a house full of boys, I struggled to keep it all together. Our house was busy and loud most of the time since we homeschooled our boys. A great deal of my days were consumed with teaching, and training the boys, mountains of laundry, and trying to cook healthy meals to boys that were bottomless pits. On one particular day, we finished our school early and made plans to go meet some friends at the park. Before we left, I wanted to get a head start on dinner so put a pot of dried pinto beans on the stove, covered them with water and planned to quick soak them before we left to go to the park. That way dinner would be quick and easy to cook when I got home. Between looking for a lost shoe, trying to find the bb’s to the airsoft gun, and getting out of the house in one piece. It was a usual but hectic time just getting out the door to go meet our friends. Finally, we get to the park, and the boys all run off to meet their friends, and I look forward to some much-needed mom fellowship…. My post goes live tomorrow and I would love for you to check it out. Behind Every Great Man Find out What a Pot of Beans Taught Me About Being an Excellent Wife!